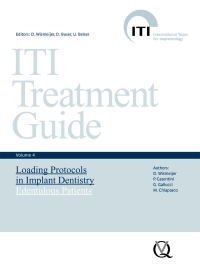 This fourth volume of the ITI Treatment Guide series presents implant therapy approaches and procedures in edentulous patients with a special focus on loading protocols. After discussing the current evidence base in the literature and a summary of the most recent relevant ITI Consensus Statements it proceeds to guide readers through the entire treatment process. Beginning with a chapter on preoperative assessment and prosthetic planning, different treatment options for the edentulous arch are presented. They are complemented by a separate chapter on the selection of the appropriate loading protocol considering risk evaluation and the complexity of the possible treatment options. Various procedures are illustrated with patient case studies. Detailed illustrations serve to clarify potential ambiguities, and complications are addressed to avert the most common problems in clinical practice. "The book can be recommended for both surgeons and restorative-based dentists in the field of implant dentistry as it aims to provide clinicians with practical clinical information that will allow them to make evidence-based decisions regarding appropriate management of edentulous patients."